Persistence Market Research analyzes the global piling machine market over a seven-year period (2017–2024) and provides data for the year 2016 along with a comprehensive market forecast for the said period. The main objective of the report is to identify key trends and opportunities in the market. To assess market opportunities, the market is divided into two segments namely by product type and by region. By product type, the market is segmented into diesel hammer, vertical travel lead systems, hydraulic hammer, hydraulic press-in, vibratory pile driver, and piling rig. The report provides in-depth analysis of the global piling machine market in terms of volume and value across the five key regions of North America, Asia Pacific (APAC), Latin America, Europe, and Middle East and Africa (MEA). 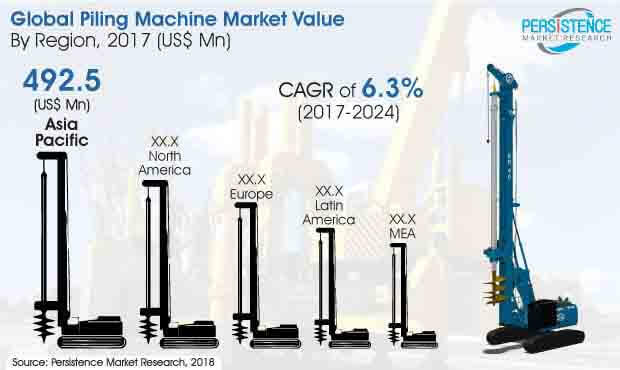 To provide a better understanding of the market the report also includes a comprehensive analysis of key market drivers and restrains and throws light on the regulations influencing the global piling machine market. The subsequent sections analyze the global piling machine market considering the product type segment and regional segment; and provide a thorough forecast for the period 2017–2024. The last section of the report features a comprehensive competitive landscape with a dashboard view of piling machine manufacturers across the globe. The report also provides strategic recommendations to enable market players to capitalize on growth opportunities in the market. Also included are the company profiles of some of the major market players. This level of information has been provided to enable clients to assess strategies deployed by market leaders and help them develop effective strategies accordingly. The final section of the global piling machine market report presents a competitive market landscape to provide report audiences with a dashboard view of leading market players operating in the global piling machine market, along with their market performance, SWOT analysis, and key business strategies. The report further discusses how the overall competition in the market is steadily increasing and discusses various factors that are shaping internal as well as external competition in the market. Internal competition in the global piling machine market is comparatively high. To estimate the market size, various viewpoints on the basis of detailed primary and secondary research are considered in the report. Further, data inputs such as market split by product type, regional split, and qualitative inputs from industry experts have been taken into consideration before concluding the market estimates. Market forecast is estimated using the current market size, which formulates the basis for projecting how the market is likely to grow during the forecast period. Given the fluid market characteristics, the report triangulates the gathered data on the basis of various analyses using both demand side and supply side drivers as well as several dynamics of the global piling machine market. However, computing the market size across the different segments is a matter of quantifying expectations and finding opportunities rather than rationalizing them at the end of the forecast period. The report takes into consideration the ever-fluctuating nature of the economy and conducts market forecasts not only in terms of CAGR, but also after considering important parameters such as Year-on-Year (Y-o-Y) growth to understand the predictability of the market and to help identify growth opportunities for key market players. The report also analyzes the global piling machine market based on the absolute dollar opportunity, which is typically overlooked while estimating the market forecast. However, from a sales perspective it is essential to identify absolute dollar opportunity to help identify potential resources in the piling machine market. Persistence Market Research has also developed a market attractiveness index to understand the key segments in terms of their performance and growth in the global piling machine market. This market attractiveness index is aimed at enabling clients to identify existing market opportunities. Global construction industry is registering a steady growth due to high rate of urbanization and increasing demand for roads, rails, buildings and associated infrastructure as result of growth in population. In addition, governments of various countries across the globe are focusing on development of transportation infrastructure. For instance, in 2015, the U.S. Congress passed a bill for spending of US$ 305 Bn to improve quality of highway network and transit systems. The U.S. government spends around 2.2% share of GDP on developing infrastructure. In 2015, the Chinese government is also spending heavily on infrastructure, and has announced projects worth US$ 1.1 Trillion to revive the economic growth and GDP of the country. In July 2016, India launched several projects, which include the development of 24 smart cities, 23 industrial hubs, two ports, and a 1,500 Km, six-lane express highway. Such initiatives of governments will boost the construction projects across the globe resulting in growth of pile foundation work, which in turn is likely to fuel the demand for piling machines. Construction of buildings, bridges, railways and various other types of infrastructure requires costly piling machines capable of driving piles into the ground to the required depth. Due to the high capital investment the small and medium size construction contractors prefer rental of machinery or purchase of old machinery rather than acquiring new piling machines, thereby restraining the growth of piling machine markets. Furthermore, the low replacement rate of piling machines, due to long life of piling machines is another factor restraining the market of piling machines. Global piling machines market is dominated by leading players such as Bauer Group, Casagrade S.p.A, and Junttan Oy etc. who provide high value piling machines in the global piling machine market. Small manufacturers of piling machines in emerging economies such as China and India, where the cost of production is relatively low have an opportunity to expand themselves in the global market. Similarly, existing players are looking forward to expand their production facilities in the emerging economies which help them to cater the demand of piling machines in the emerging economies as well as reduce their cost of production. This helps them to attain a competitive advantage in terms of price and the delivery time. Piling machines manufacturers are adopting various differentiation strategies by constantly upgrading their products using technological innovations to improve their efficiency and comply towards mitigating adverse environmental impacts. For instance, diesel hammers are being slowly replaced by hydraulic hammers due to environmental concerns. In densely populated areas, hydrostatic pile drivers are used to drive the pile into the ground or to excavate the piles which works on vibrations to avoid complains related to noise pollution and dust. Sales revenue in Latin America is estimated to increase at a moderate CAGR over the forecast period to be valued at US$ 79.7 Mn by 2024. This is mainly attributed to a rapid growth of the mining industry in Peru and Chile, owing to discovery of abundant copper and gold reserves. Sales of piling machines in North America was valued at US$ 235.5 Mn in 2017 and is anticipated to increase at a moderate CAGR over the forecast period, to reach US$ 328.7 Mn by the end of 2024. Piling machines sales volume in North America stood at 409 units in 2017 and is projected to reach a number of 522 units in 2024.